If you read this blog often you probably know I'm a huge fan of Jeff Goins. I faithfully follow his blog Goins Writer. His e-book The Writer’s Manifesto inspired me to write a manifesto of my own. And the only book review I’ve posted on this blog was of his book You Are a Writer. So it should be no surprise that I wanted to be part of Goins' blog tour for his latest book Wrecked, which is all about getting out of our comfort zones and striving to be a light in the dark places of our communities and our world. Goins says in his book that being wrecked begins with an experience that not only pulls you out of your comfort zone, but also breaks your heart and causes you to have great compassion. For him, it was a call to serve the homeless. For you, it may be something completely different, but regardless being wrecked is about being uncomfortable. I was eager to be part of his blog tour not simply because I enjoyed the book or because I'm practically a Jeff Goins groupie. I wanted to interview Goins for you, my beloved loyal readers. I wanted to interview Goins because his words change your lives. This summer I received an email from a reader thanking me for my review of You Are a Writer. After reading my post she decided to check out Goins Writer. 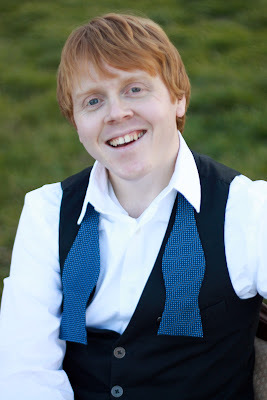 In her email to me she wrote: "Jeff Goins has changed my life... I have been inspired to embrace my writer self after reading his blog." And she acted on this decision. She wrote an essay and submitted it to a popular website that was published in July. For people who aren’t familiar with the book can you briefly explain what it means to be wrecked and why we all need to have this experience? 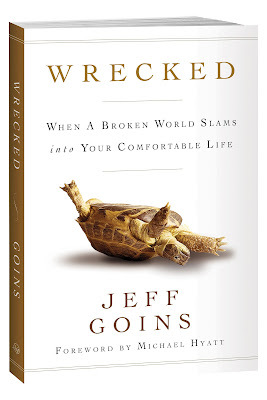 Jeff Goins: Wrecked is a book about the life we’re afraid to live — one full of radical sacrifice and selfless service. It’s a look at how we discover fulfillment in the least likely of places. We all want a better life, but we're looking in the wrong places. Instead of inwardly, we need to be looking outwardly. You say in your book that being wrecked is about being uncomfortable and that sometimes use certain things to try to escape discomfort, things such as social media. How can we use social media to make a difference instead of using it as a distraction? It's all about motive. Is social media an escape or a destination? Do we lose ourselves in it or find it? A lot of people I know are using online tools to literally change the world. Check out invisiblepeople.tv for a powerful example. In your book you state “…we find our vocations not by focusing on ourselves, but by focusing on others.” Can you elaborate on that a bit for my readers who may be still searching, trying to find their purpose in life? Happiness is a paradox. When you seek it out, you rarely find it. Just look at rock stars, celebrities, and so forth who keep ending up in rehab. If achieving all our dreams (to be famous, to be recognized, to have the world applaud your work) still doesn't "do it" for us, what does? Simple: focus on others. Make your story about more than you (because it is, after all). The happiest people I know have built a life that is not about them, but makes room for others. In one chapter you talk about how sad it is that some people with amazing voices won’t sing because they’re afraid to do so. And in that passage you compared music to love. This made me think of people who won’t share their writing with the world because they’re afraid to do so. Do you think we can love the world, in part, through our writing? Yes, definitely. There is something powerful about art that speaks to the soul. I can't explain it; I can only surrender to it. The irony is what often feels like clunky, awkward work to you, the artist, is music to the listener's ears, so to speak. In other words, practice the fundamentals. While reading Wrecked I felt self-centered for wanting to pursue my goals. How can we be wrecked and still go after our writing goals? I can identify with that feeling. I struggled with it for five years before giving into the call to write. But when I finally recognized it as a calling, it became easier. For me, a calling isn't about you; it's about others. Your vocation is a gift given to you with the intention of it being shared with others. Your words are supposed to speak to people, to help them, maybe even entertain them and make them feel not so alone in this great big universe. If you think about writing like that, it becomes easier to start (but still pretty scary, given all the implications). I would encourage you (and others) to consider that something as seemingly arbitrary as typing on a keyboard may be about more than you and your "goals." It's about your purpose, about the masterpiece the world needs you to create. Not for you, but for them.